Elgar was one of Coates’s most admiring auditors and used to insist on receiving his discs. He must have been one of the earlier collectors to announce to the younger man that he’d "worn out" his disc of one of Coates’s tunes. Fortunately we can’t wear out this long-delayed specimen from the newly revivified Lyrita label. In it we have a good selection, endearingly served up by Barry Wordsworth and the LPO. Pressed and copyrighted 2007 though they may be these are assuredly much earlier. The Three Men suite is a brisk study in contrasts. The Man from the Country whistles a folkloric tune and walks with a brisk gait. He’s confident, elegant and certainly no bumpkin; his county is more the metropolitan fringes of Sussex from the sound of it than the rude acres of, say, Gloucestershire; and his breezy nonchalance reaches an impassioned climax; no yokel, he, more an umbrella-and-bowler sort of chap. The Man-about-Town might even be Coates himself – laid back, twinkling, terpsichorean, off for a Foxtrot at the Monseigneur perhaps. There’s a Glamorous Nights feel to this – deliciously knowing. The Man from the Sea brings with him an absorbing shanty feel but otherwise not too much nauticalia. Three Blind Mice makes a bid for melodic freedom and there’s a crafty fugal section as well – so this chap has a whimsical sense of humour, and doesn’t take himself too seriously. These three wittily pointed character portraits are a delight – what a pity Elgar never lived to hear them. Dancing Nights is a concert waltz (valse to be accurate) and an elegant and astute affair written in 1932. The following year Coates crafted the Two Symphonic Rhapsodies. The first is I Pitch my Lonely Caravan in which Coates seems to relive his early years as an orchestral and chamber viola player – this is sunk deep in the Russian muse, Tchaikovsky predominately. The second Rhapsody gives us the great hits Birdsongs at Eventide and I Heard You Singing. The former sings with ripe affection whilst the latter explores the sheer singability of the song with practised charm. The longest single work is the 1946 Ballet: The Enchanted Garden which clocks in at twenty-one minutes. 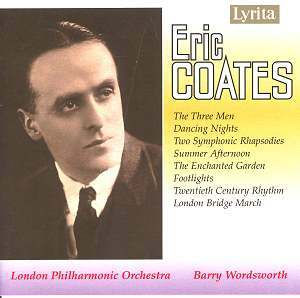 This is a most enjoyable fare and shows the range of influences on Coates – a most open-minded composer not least when it came to transatlantic trends. There’s an awful lot of Gershwin here, from the syncopation to the actual accent of the melody lines – some Kern as well (he was clear about his admiration for Kern). Some passages do sound very Porgy-like and there are hints of An American in Paris as well. The cheeky fugue is followed by a dreamy end. To wrap up this delightful programme – well selected and with not overmuch opposition in the catalogues - we have a trio of pieces. Footlights is an avuncular waltz, London Bridge a well known March – splendid trio, nautical air – and there is the final movement from the Four Centuries suite of 1942 – Rhythm. This, very naughtily, is a paraphrase of Fascinating Rhythm – complete with dance band saxophones and off-beat Max "Frying Tonight" Bacon percussion. This is a secure port of call for all Coates collectors. Its Lyrita brother volume, with Boult conducting Coates, is now also available and has been reviewed by me. This Wordsworth volume however has more Coates, rarer Coates, and better-played Coates.